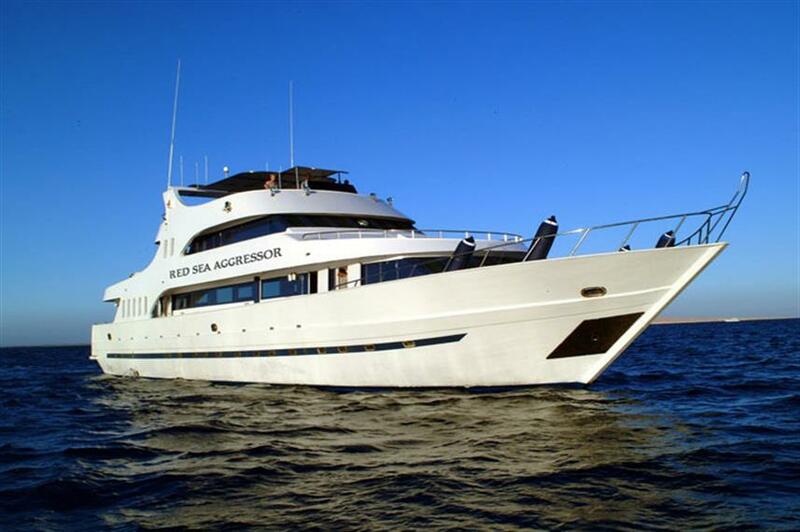 The M/V Red Sea Aggressor is a 36.5m world class liveaboard yacht scheduling year round seven and ten day Egyptian diving cruises. 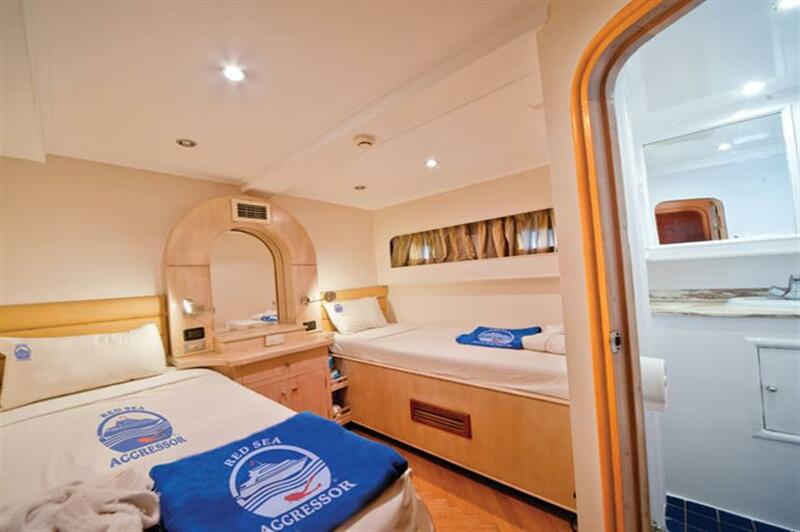 Aboard Red Sea Aggressor, divers will swim among hammerheads, dolphins and abundant reef fish. 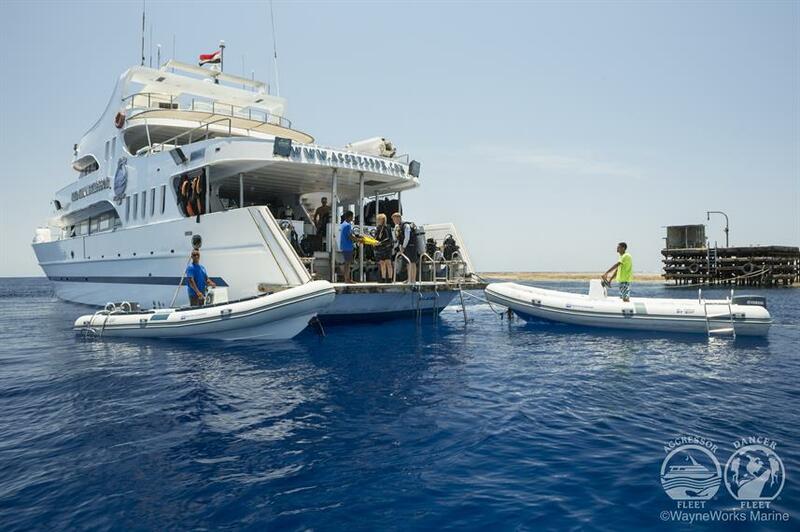 Scuba diving with the Red Sea Aggressor Egypt offers up to five action packed dives each day along with spectacular night dives. All diving is done from a spacious, well equipped skiff. 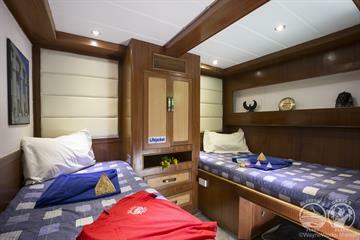 Topside, an attentive crew of 12 is on hand to ensure the comfort and satisfaction of up to 20 guests. MV Red Sea Aggressor has 10 lavish staterooms equipped with private bathroom and shower, storage, television and individual climate control. The onboard menu features a variety of International fare and local cuisine. Soft drinks, iced tea, beer, and wine are complimentary. 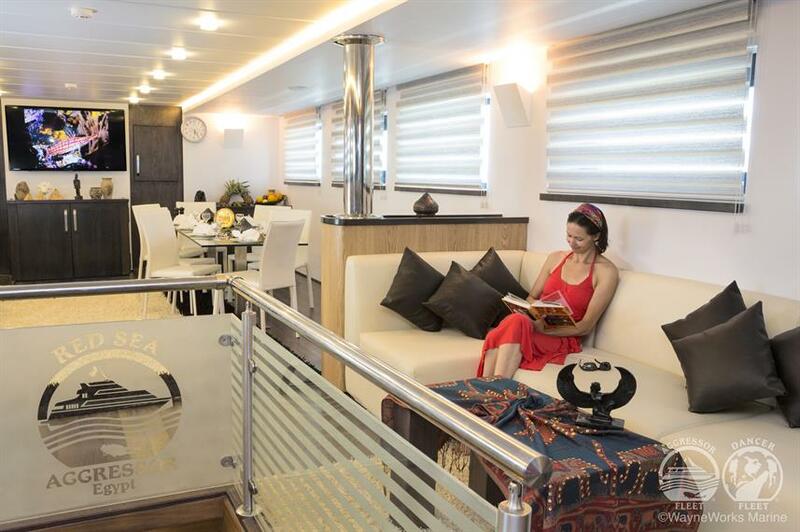 Guests can relax in the spacious lounge and enjoy the sun deck with Jacuzzi, loungers, deck chairs, bar service and CD/stereo player. 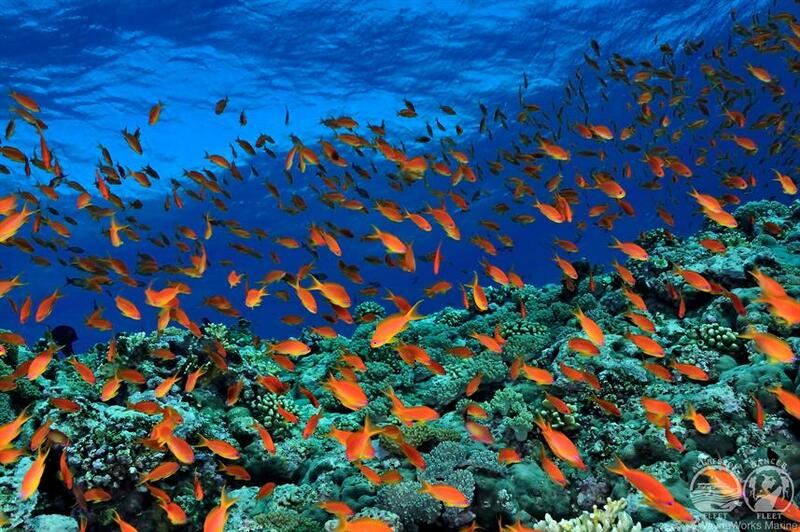 A Red Sea Aggressor Egypt diving holiday is a fantastic adventure. Book today. Required Extras: National Park Fees (105 USD per trip), Port Fees (39 USD per trip), Visas and Fees (25 USD per trip). This was our first time on a liveaboard experience. It was definitely a memorable one. From the time we arrived until our departure we felt like family. The crew is definitely a big part of a liveaboard experience. The crew went above and beyond what we've ever experienced in our diving experience. We almost felt like toddlers being dressed before our first day of school. It felt like our mom was always around to make sure we were hydrated and warm. All throughout the 6 days of diving, the crew were consistently on hand to zip up your wetsuit as needed, strap your fins, assist with your BCD, defog your mask and double check your gear after your dive buddy has already checked you out. The steward serves you water before you jump into the blue and warm hot chocolate when you get back on the boat. A warm towel is draped on you immediately after they've assisted you in removing your wetsuit. And they immediately wash and store your gear back in your assigned crate. We can almost say, that they literally do everything except equalize and achieve neutral buoyancy for you. 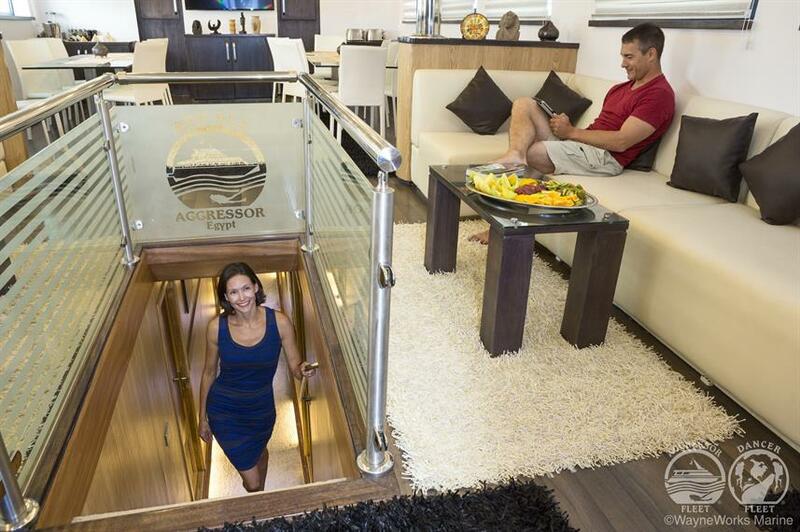 These guys have spoiled us rotten aboard the Red Sea Aggressor 1 dive safari in Egypt. The dive masters were very knowledgeable and pleasant and always on hand to assist and answer any question one might have. We took our advanced open water and nitrox certifications during the week and it was worthwhile. 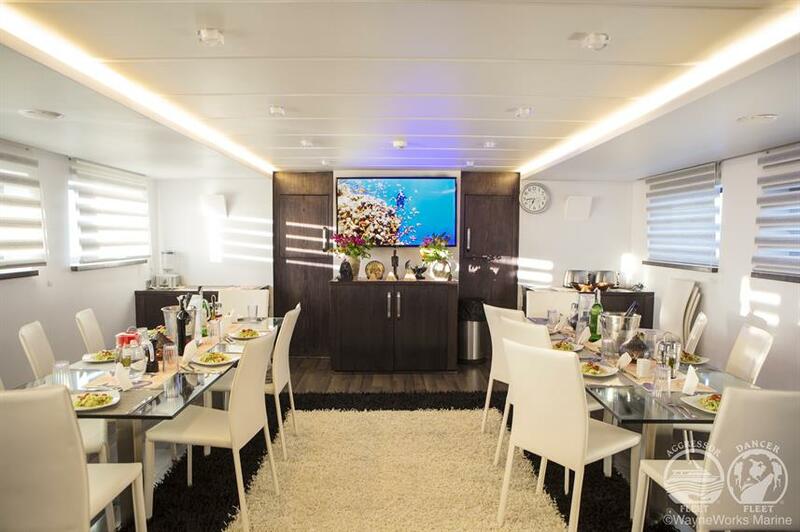 As for the boat itself, it was quite spotless but we just had trouble flushing the cabin toilet which they said was normal for the boat. In terms of the diving, we expected to see pelagic fish but only saw one thresher shark and silky sharks swimming around the boat one night. 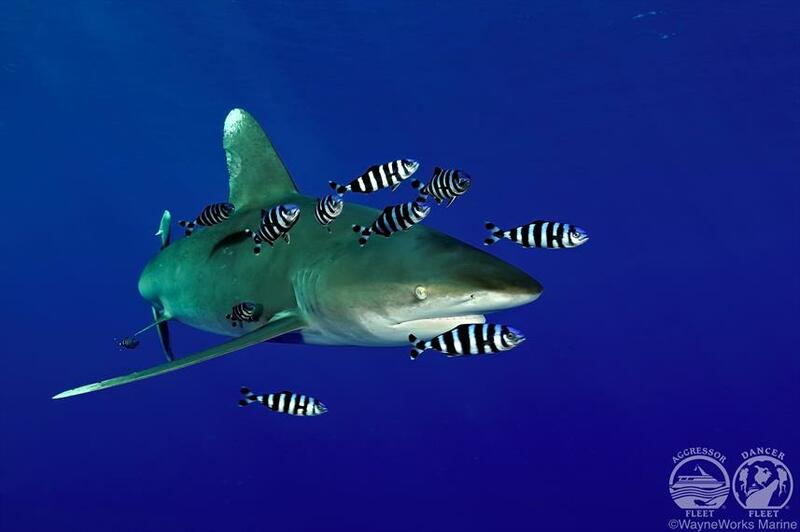 This however is beyond the operator's control since we came out of season for hammerheads, oceanic white tip sharks which we had hoped to see in this trip. The food served went beyond our expectations! It's a conundrum how the resident chef could turn out gastronomical delights from such a small kitchen. We even had a full roasted turkey with the trimmings on one of the evenings. Crème brulee, bread pudding, steak, etc. we could go on & on but suffice it to say, that we were never left wanting. This was a true dive, eat, & sleep experience. We highly recommend this experience and hope to do one again soon with Aggressor fleet. Boat was spotless. Service was A+. Got blessed with awesome new friends! 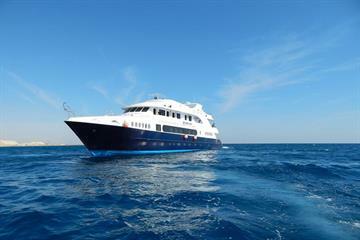 I went on a six day diving trip aboard the Red Sea Aggressor 9-15 April. They offer 5 dives a day! We were up at 6am and diving by 6:30am; finishing the night dive by 8pm with the formal dinner starting at 8:30pm. Only one of our group received the Iron-Man metal for doing all the dives. The sea was temperature was 75F. The wind blew hard the first couple of days which hurt visibility; but when the winds stopped later in the week, the visibility turned excellent! We saw hammerhead sharks, manta rays, octopus, Spanish dancer, turtles and lots of coral and sponges. And the biggest treat of all was making my first dive ever with a pod of dolphins. Very enjoyable trip! GREAT BOAT/CREW, GREAT FOOD, and GREAT DIVING!!! 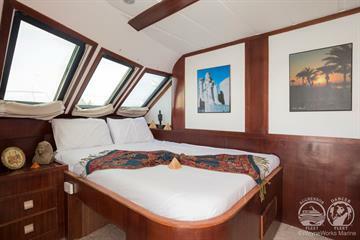 Our first liveaboard experience and boy it was a good one. 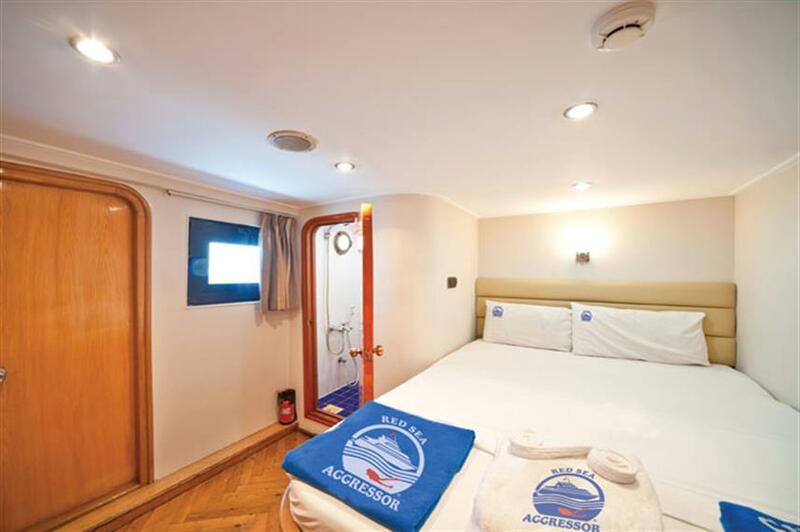 The staff does everything to make you feel conformable, especially the seamen and pursers. From hot towels after a dive till chocolates on your pillow. The food is beyond excellent (with the complimentary 4 kg on the scale), there are loads of snacks in between and the ship is comfortable even when full. The only thing that we would like to have seen different is the amount of Dive Guides in the water. Now, there was only one out of three on board in the water per dive, where off sometimes this was the photographer. We now missed some of the big stuff because we were going by ourselves, to get away from the crowds and to not have to dive with the Open Water Level divers. Also, before booking it says transfers included, however this is not the case, only for the arrival transfer. For the return transfer they wanted to charge us 70 USD for a 10 minute cab ride, so we decided to arrange this by ourselves. Apart from this an amazing experience and we hope to dive with you again. Diving of course, before breakfast! The best week of diving I've had in a long time! It is only a small gesture, but when coming out of the water after the 4. dive, slightly freezing, getting wraped in a warm towel and being handed a delicious drink, - thats just awesome! The different dive spots are well picked (southern itinerary, Elphinstone, Daedalus, Claudia..). I'm very fond of the detailed briefings as well as how good the staff took care of our equipment. Also, our Steward Ali always turned our (sometimes messy) room into a comfy and clean retreat. 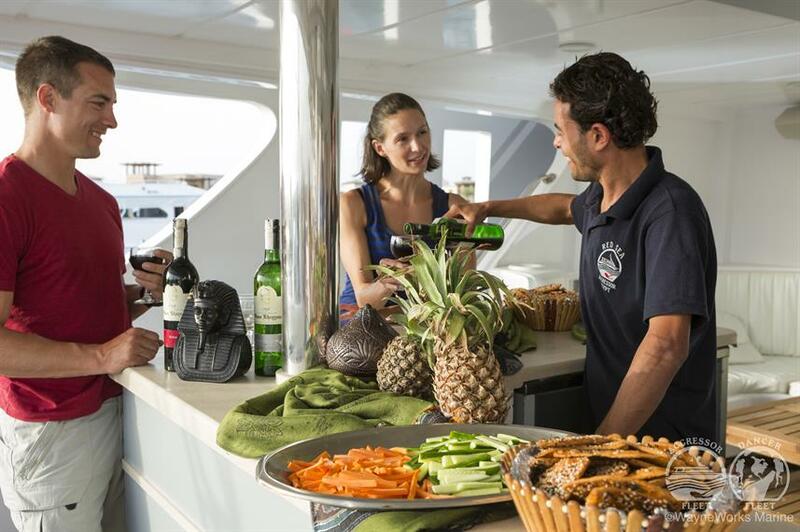 The food on board is a good mix between local and international cuisine. I ate way too much, and I don't regret it :) This was definitely not my last trip with Aggressor. They promise Dive-Eat-Sleep and that's exactly what you get! 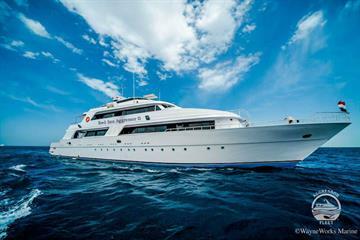 Very comfortable boat, super friendly and attentive staff, very well organised diving trips. 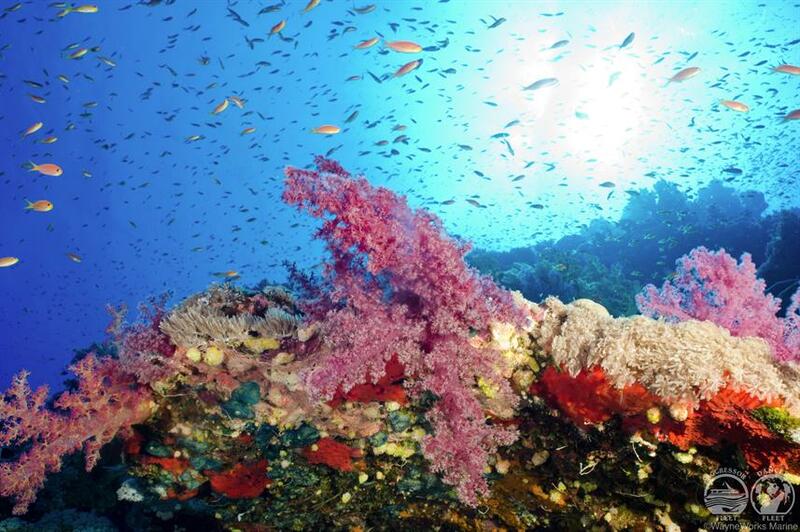 The Red Sea is mandatory in a diver's curriculum. Having this experience surrounded by good professionals in a good boat, with an excellent crew is fundamental to add value to this experience. Excellent week with about 20 dives in a sea with the most beautiful coral in the world. We saw hammerhead sharks, napoleons, oceanic white tips, mantas, ... relaxed dips of low difficulty level. Shaab Sharm had stunning walls with amazing soft corals and beautiful fan corals. The diving at St John's is fantastic, personally I preferred it to the pinnacle sites (Daedalus, the Brothers, etc). Also this is the first boat I've been on where they specifically planned dive times to avoid the guests from other boats in the water. The crew went the extra mile at every opportunity, making a little celebration out of milestone dives (500th for me) and overall the attention to detail and service was better than other liveaboards I've done. Saw a couple hammerheads Staff was professional and helpful The boat itself was very pleasant in terms of comfort and space. it was quite chilly tho, every meals were really awesome and diving with aggressor is absolutely recommendable. 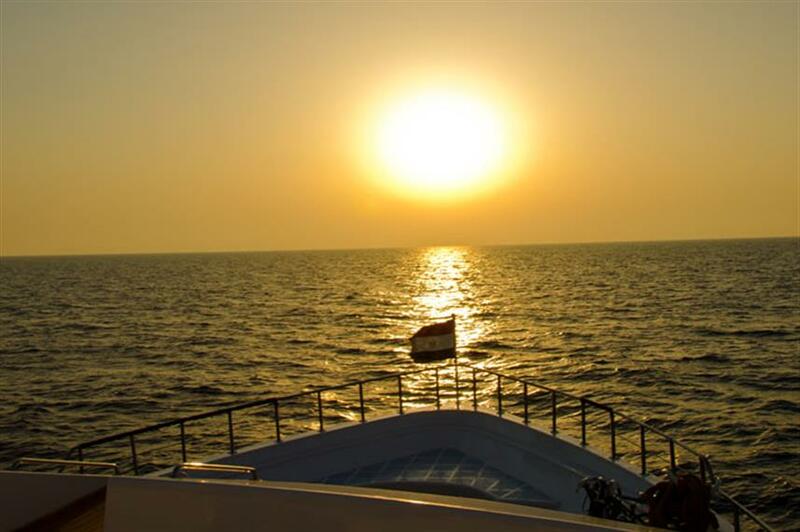 This was our first trip to the Red Sea, and with so much to see, we are certain to return again soon! We knew that we were not going at the high season for the large pelagics, and military exercises prevented us from making it to St. Johns, but the abundance, variety, and uniqueness of life on the reefs was stunning. Snorkeling with a pod of Spinner dolphins on the third day was also a quite a treat. the attentive staff, the impressive food, and of course the diving! This was our second time with the same crew. Crew very helpful, and attentive. The food is excellent. The dive guides are very attentive and provide very pleasant experience. 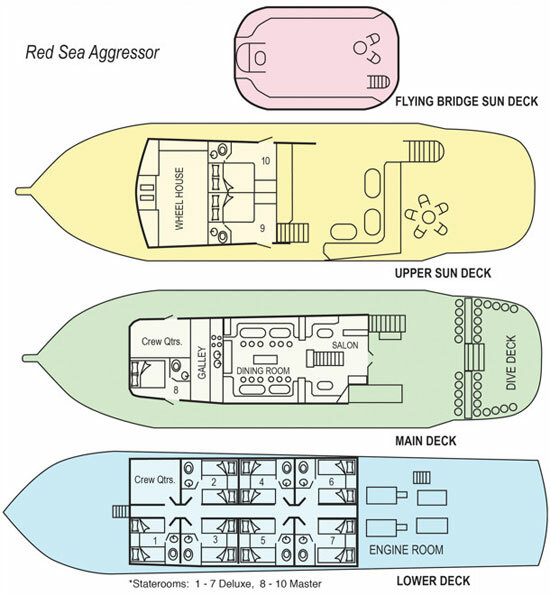 I strongly recommend Red Sea Aggressor. My trip with the Red Sea Aggressor was the most memorable trip I’ve had so far. From the amazing friendly staff to the increíble dives and service, food and comfort on the ship. Hammerheads and Manta Rays. 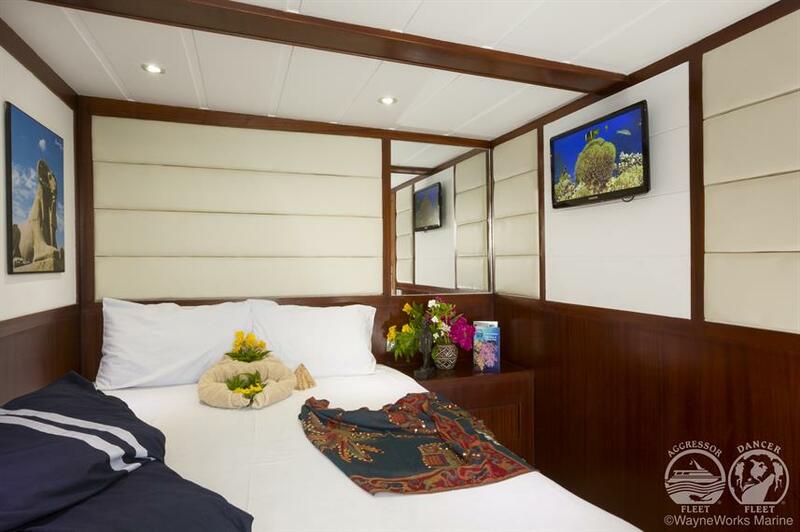 Amazing live coral and marine life and visibility for miles. Amazing Dives, Staff’s attention and the food! Great food, great guides. Boat should be better organised. On sun deck we miss tables to put dring on, lazy bags will be nice touch. Abu Dabab, Claude, Spanish dancer, groep divers, crew, whole concept. This was a fantastic trip for me. 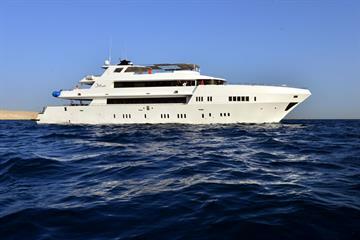 It was very good for value of money and a luxurious boat. The diving was very good. It was at an easy pace, with lots of variety and nothing too deep. 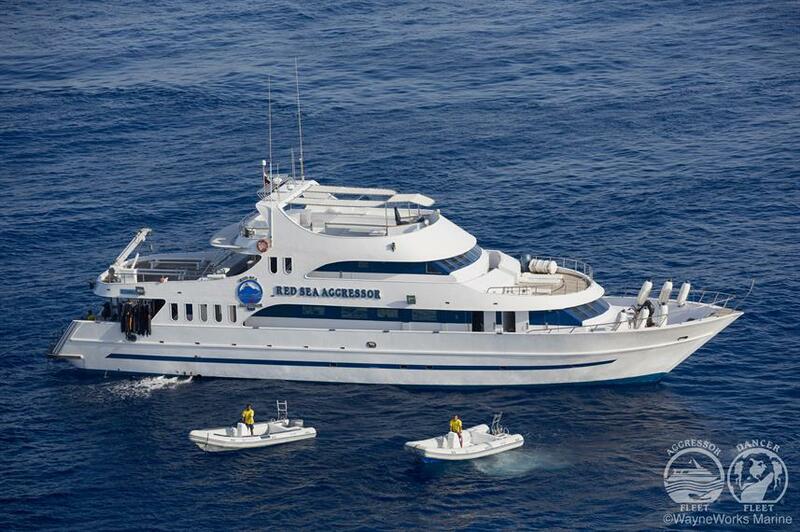 We were part of a small group of guests so we got very good attention from the dive staff and seamen. Meals were plentiful and varied. Clear seas, no current, plenty of fish. The service was very good. The dive sites were enjoyable. the diving was awesome, the boat was really nice and the crew was very helpful! They really tried everything to make us as comfortable as possible. The food was also really good. No complaints ! crew was friendly and the food was great also diving in red sea never let me down. Divings in Daedalus Island. 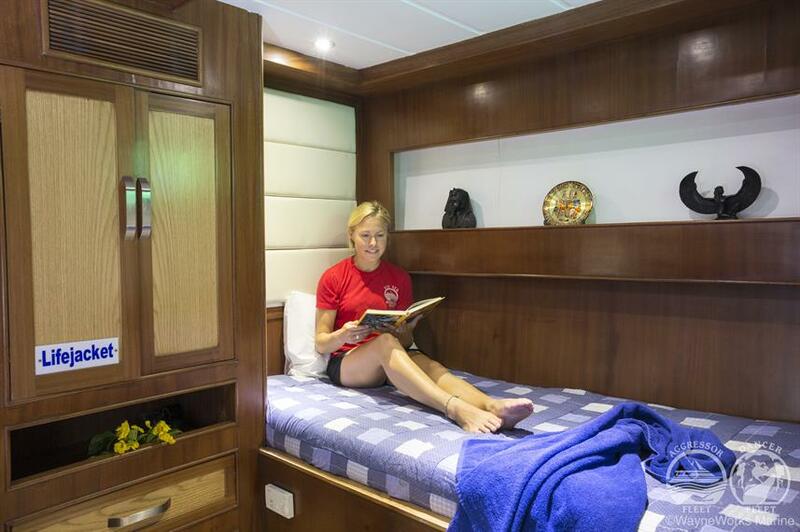 Comfort beds and good amenities in the cabin. Very well organized. 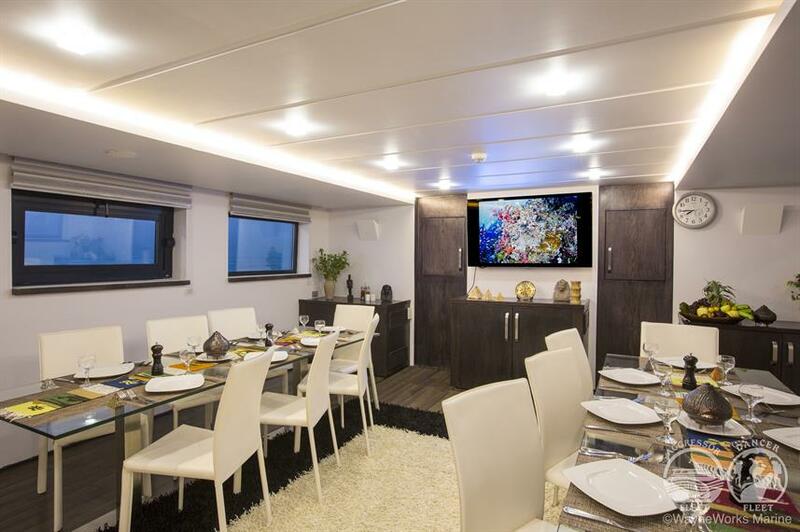 Would recommend yor vessel and the tour l was on, very enjoyable and staff couldn't do enough to make my trip as pleasant as possible. 10 out of 10. Good time on-board, relaxing and worth coming back. 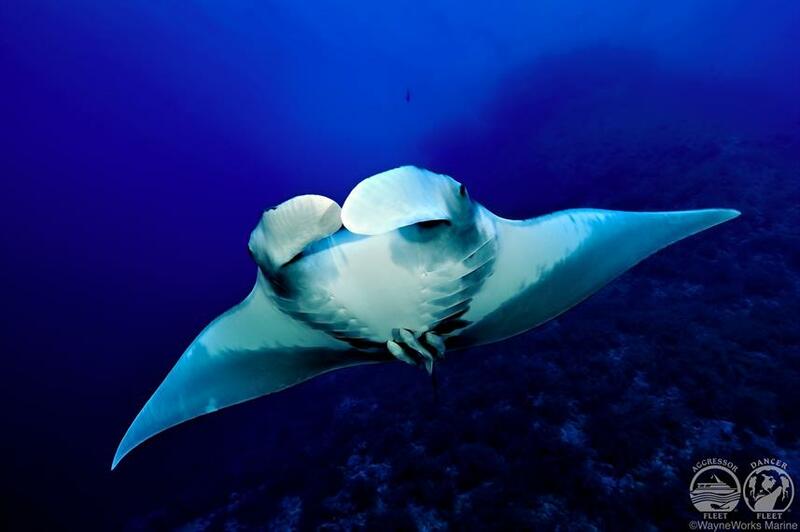 Seeing manta's and sharks while diving. The party on the last night was also a fun experience. The staff is perfect and there was quality as assured. Excellent top quality dive trip. Great diving in amazing comfort! Diving was good, with quite a few sharks sightings, and beautiful coral. The weather didn't let us dive Elphinstone, but Brothers and Deadalus were up to their reputation. 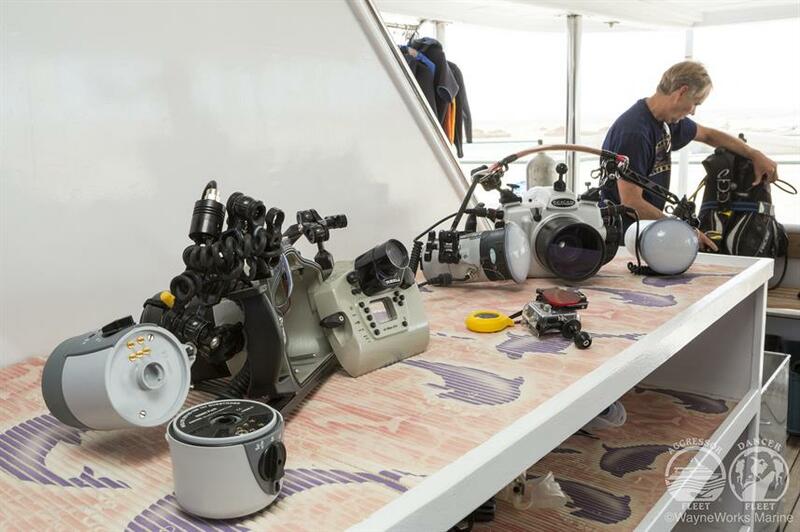 What amazed us though was the attention to details from the crew, with hot dry towels after every dive, right out of your wetsuit, a fresh juice, and they do everything for you, including rinsing your camera and wersuit and put it to dry after everydive! Little things that make the trip so much nicer. The price however is a lot higher than their competition. Big advantage as well is that you do 4 dives a Day instead of 3 on other boats. Up to you to decide if it is worth it for you. Best dives ever and pefectly arranged ! Deadalus reef !, the hot showers and warm towels, Abu Dabab 1 - 4 white tips in a cave :), Dolphin house/Sataya reef, Sha'ab Sham(r?) lots of big fish.......so many splendid dives - thanks guys !!! We had a great group. you have a fantastic team and I had a wunderfull time, thanks again.